Still anchored off Provincetown, everyone awoke each morning praying the weather would break so we could head back to our site; however, it was day five and still no relief. It almost felt at times like the movie, Groundhog Day. Each crew member fell into a routine of daily chores. The security guards (ex-marines) would walk around both ships to secure their safety. At night you would find them in the lounge area with loud music playing while they cleaned their weapons. (How dirty could weapons get in a day?) The cameramen walked around looking for something interesting to film or would strike up conversations with various crew members on their feelings about the project. A few of the crew would be chipping, sanding or painting something that was already starting to rust. A couple guys would be in the engine room doing what needed to be done to maintain a ship. Greg was either in the pilot house checking the weather, or in his room on the computer or cell. 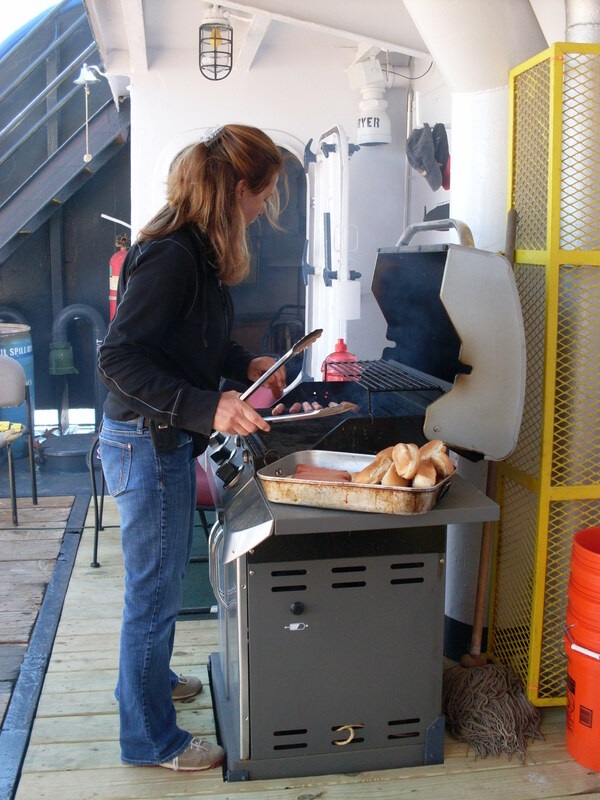 And of course, I would be found in the galley cooking or cleaning for the next meal. It was with great relief when Greg stated that we would take the next few days to learn or hone up on some basic skills that would come in handy while on board. Some of the crew had worked on ships for years and would be the teachers. It was set up to spend two or three hours on learning one specific skill and then move onto another one throughout the day. There were a couple classes that were mandatory, like fire safety, but basically we got to choose the ones that interested us the most. I chose knot tying right off the bat. There was a book onboard that I picked up about various knots and I was intrigued, who knew there were that many different types of knots. The next morning our classes began right after breakfast. Stations were spread out throughout the deck for each class. Everyone was eager and there was something new for all to learn. (Of course, some of us had a lot to learn). I picked up my piece of rope and watched while Matt tied a simple knot, called the slip knot. Within a couple tries, I had it down. Next came the Bowline knot. One of the most widely used knots. It only gets stronger when there is tension put on it, but can easily be taken apart. I loved the way it looked when it was done correctly; however, it was a challenge for me. I ended up carrying my piece of rope around for days and would practice. I did finally get it, but you could easily tell mine from the others. We also had a diving class and that was what most wanted to learn. . Gary is a PADI dive master and taught that one. I really wanted to learn to dive, but not in the cold New England waters, so I skipped that one. It was a nice diversion for us while we waited on the weather to change, not to mention learning new skills. The days went by quickly and everyone was happy to show off what they had learned. There were a few avid fishermen aboard so each night when work or classes were over, it was time to fish. They would set their gear and chairs on the stern and spend the remaining hours of the evening fishing. Greg and Dave had fished most nights but without any luck. This one particular night, Shaun decided he wanted to give it a try. The strippers were running and everyone was hoping to land the big one. Shaun threw his line in and within five minutes landed a good size stripper. He was grinning from ear to ear. Then within a few more minutes, bam, he landed another one. The others still hadn’t caught one. They were teasing him that it was just beginners luck as he didn’t even know what type of lure was used. When he landed his third and biggest one, he started to get cocky, as only guys can do. This wasn’t sitting well with the others as there were some egos on the ship, especially when it came to fishing. This went back and forth for a period and I was getting the biggest kick out of it. To watch grown men revert to almost acting like children was hilarious. When it was all said and done, I believe he caught five keepers. Though the others might have been jealous, they sure loved eating it the next night when I cooked in on the grill. I have to say; the last two days of classes and fishing were priceless.